- cakephp/cakephp 3.3.4 requires ext-intl * -> the requested PHP extension intl is missing from your system. - cakephp/cakephp 3.3.3 requires ext-intl * -> the requested PHP extension intl is missing from your system. - cakephp/cakephp 3.3.2 requires ext-intl * -> the requested PHP extension intl is missing from your system. - cakephp/cakephp 3.3.1 requires ext-intl * -> the requested PHP extension intl is missing from your system. - cakephp/cakephp 3.3.0-beta3 requires ext-intl * -> the requested PHP extension intl is missing from your system. - cakephp/cakephp 3.3.0-beta2 requires ext-intl * -> the requested PHP extension intl is missing from your system. - cakephp/cakephp 3.3.0-beta requires ext-intl * -> the requested PHP extension intl is missing from your system. - cakephp/cakephp 3.3.0-RC1 requires ext-intl * -> the requested PHP extension intl is missing from your system. - cakephp/cakephp 3.3.0 requires ext-intl * -> the requested PHP extension intl is missing from your system. - Installation request for cakephp/cakephp 3.3. 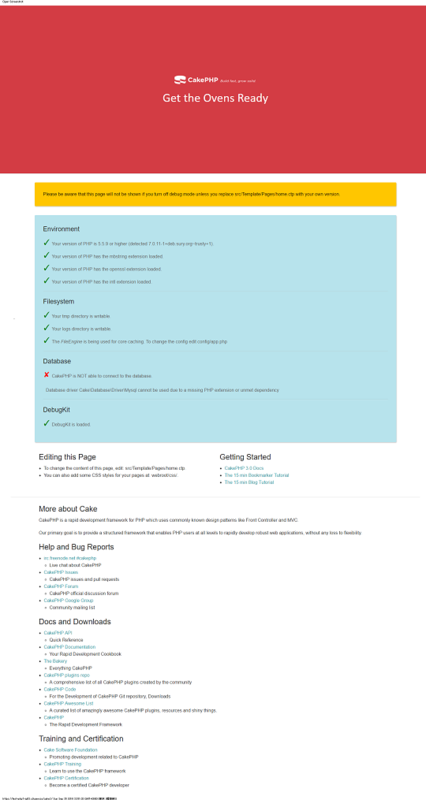 * -> satisfiable by cakephp/cakephp[3.3.0, 3.3.0-RC1, 3.3.0-beta, 3.3.0-beta2, 3.3.0-beta3, 3.3.1, 3.3.2, 3.3.3, 3.3.4]. 0 upgraded, 1 newly installed, 0 to remove and 83 not upgraded. After this operation, 560 kB of additional disk space will be used. * - salt - A random string used in security hashing methods. *   The salt value is also used as the encryption key. *   You should treat it as extremely sensitive data.